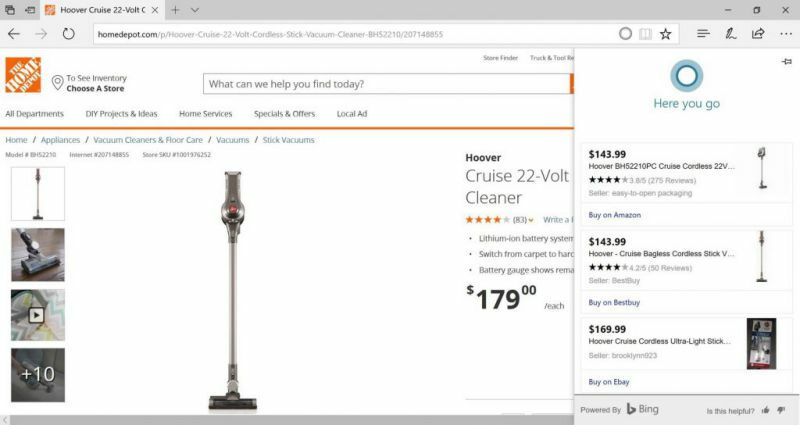 Microsoft is now rolling out new Cortana pilot feature on Microsoft Edge that will help you find the best price and availability of similar products. The new features will help you save time and money when shopping online using the Edge web browser. Cortana display notification in the address bar if there’s helpful information available for the site you’re on. When you visit the site of a supported retailer, Cortana will alert you that there are other options available at a lower price for the same product. Once you click on the Cortana icon, the information will be displayed in the right pane within the same window. However, Cortana will only notify you if the relevant details are available at the time of your visit. Currently, the feature supports 14 retailers including Amazon, Walmart, and eBay, within the US. More retailers will add in the future. The update is now available for Windows 10 Creators Update users.